It was a while since I updated this page, it is rather outdated by now. I have worked on various GBA related projects from time to time. Information on some of them is available on this webpage. 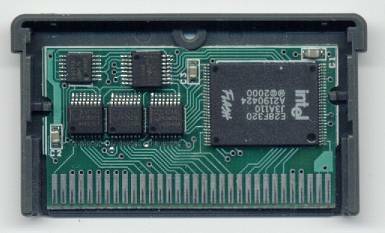 It is just a basic flashcart without any savegame SRAM. Guess it's about time I say something about the progress. I've not had much time to work on this project lately. The new is that the 32Mbit version works very well, but there is one problem, the circuit that protects the savegame SRAM agains unintentional writes during power up/down is not adequate for the task. Sometimes one or two bytes in the savegame SRAM gets corrupted (usually the byte stored at adress 0x0000). The protection circuit needs improvements, but other than that the design works perfectly, it's even compatible with visoly flash linkers. I've not yet decided if I'll publish the schematics or not since the savegame is slightly unreliable. As you can see, I'am currently working on a updated design with much more features packed onto the same PCB size, it supports 32M Intel 110ns Strataflash and battery backed SRAM, I'am still waiting for the low power Toshiba SRAM to arrive, but the flash seems to work nice. Still a few things to work out thou. The fact that this design uses Intel flash, instead of AMD flash like my first version, makes it compatible with visoly flash programmers and software. When I have verified that the entire design works I'll release the updated schematics and a PCB layout. Please don't E-mail me and ask for schematics or layout, I will release it when everything works. 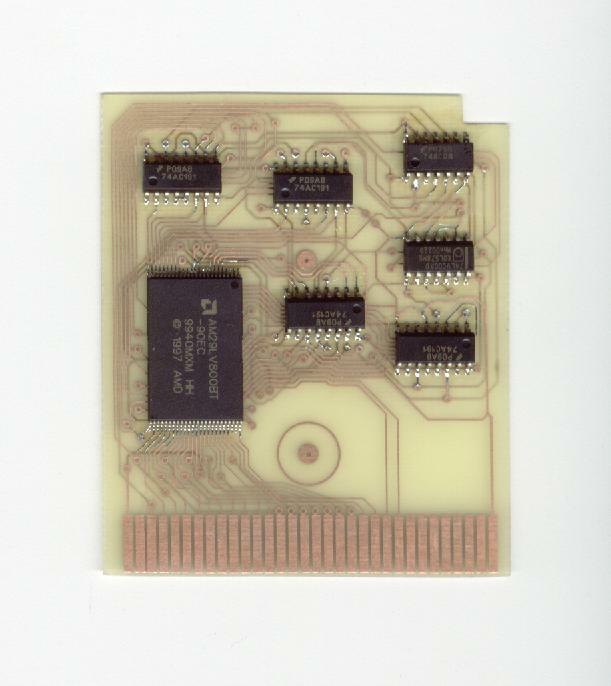 The PCB's are doublesided and 0,5mm thick, the linewidth is 8mil on the first design. I was able to extend that to 10mil on version 2.0 to make it a little easier for thoose of you who etch your own PCB's. The counters are designed to minimize overhead to allow for a little slower (cheaper) flash chips, and/or better timing margin. The flash chip can probably be any standard 3.3V 16bit wide <100ns flash chip of any size, I use a 70ns AMD part, but there's nothing that say's you can't use Intel or Atmel, or any other brand, as long as the part meets the above requirements. Use AC or LVC logic only, and don't forget to use capacitors on every IC, (not shown in the schematics). 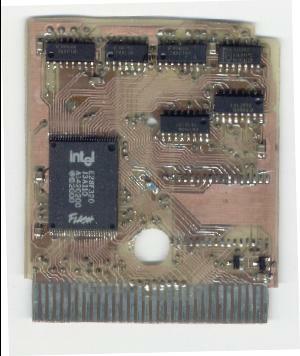 If Visoly's linker only supports the 'accelerated' programming mode, then it probably can't be used for programming any carts that's not based on Intel flash parts. Of course the usual applies: If you try to build this, then I take no responsibility whatsoever, I don't guarantee that any information on the page is correct, and I don't care if you happens to destroy your GBA or anything else.